Hardcover, 4.25 x 7 in. / 144 pgs. In The Critic as Artist—arguably the most complete exploration of his aesthetic thinking, and certainly the most entertaining—Oscar Wilde harnesses his famous wit to demolish the supposed boundary between art and criticism. 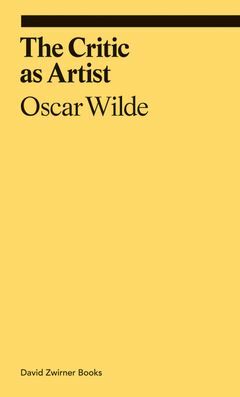 The field of art and criticism should be open to the free play of the mind, but Wilde plays seriously, even prophetically. Writing in 1891, he foresaw that criticism would have an increasingly important role as the need to make sense of what we see increases with the complexities of modern life. It is only the fine perception and explication of beauty, Wilde suggests, that will allow us to create meaning, joy, empathy and peace out of the chaos of facts and reality. Oscar Wilde (1854–1900) was an Irish poet and playwright who became one of London’s most popular writers in the early 1890s. Though often controversial, his flair for journalism and nose for scandal ensured that he was widely read. His bold essays on aesthetic philosophy, collected in the volume Intentions (1891), remain important and influential meditations of the nature of art criticism itself. FORMAT: Hbk, 4.25 x 7 in. / 144 pgs.